Koblenz (formerly Coblenz, Coblence in French, Coblenza in Italian, Castellum apud Confluentes in Latin ; pop. 106,000) is the city situated at the confluence of the Rhine with the Moselle. The western bank of the Rhine is bordered by the Westerwald forest. Koblenz is renowned for its carnival, which has been held since the 13th century. Koblenz was the birthplace of Austrian statesman Klemens Wenzel von Metternich (1773-1859) and former French president Valéry Giscard d�Estaing (born in 1926). The area was settled at least since the Neolithic period (about 11,000 years ago), and the hill at the confluence of the two rivers first fortified some 3,000 years ago. The region was conquered by by Julius Caesar in 55 BCE. The first Roman fort was established in 9 BCE by Consul Nero Claudius Drusus (the younger brother of Emperor Tiberius). Castellum apud Confluentes ("fort at the confluence"), as the Romans called the place, was part of the province of Gallia Belgica, then, from 85 CE, to its subdivision of Germania Superior. The Franks destroyed the Roman fort in 259, but the Romans reconstructed it and remained in Koblenz until the latter days of the Empire in the 5th century. Koblenz subsequently became part of the Frankish kingdom of the Merovingians, of which it was one of the numerous royal residences. 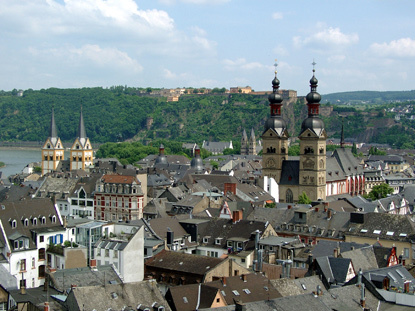 At the split of Charlemagne's Empire between his three grandsons in 843, Koblenz is inherited by the eldest, Lothair I. Upon his death in 855, his son Lothair II keeps hold of the region. But when the latter dies prematurely in 869, his uncle Louis the German, King of Eastern Francia (later the Holy Roman Empire), seizes the eastern part of his Lothair's kingdom. The city is pillaged and destroyed by the Vikings in 882. In 1018, Koblenz is given by Emperor Henry II to the Archbishopric of Trier, thus attributing secular power to the archbishop. From the 17th century, Koblenz would become the official residence of the Prince-Elector of Trier (i.e. the archbishop), while Trier remained the religious seat of the state. In 1216, Archbishop Theoderich von Wied invites the Knights of the Teutonic Order (also known as the German Order) in Koblenz and grant them some land of the St. Castor Church. The knights soon established their headquarters in the triangle formed by the Rhine and the Moselle. The spot thus became known as the German Order (Deutscher Ordt), then the "German Corner" (Deutsches Eck), as it is still called. The citadel of Ehrenbreitstein (on the hill of the same name) is progressively fortified by the rulers to keep the burghers under control. A first municipal council is created in 1276, but abolished by Prince-Elector Diether von Nassau in 1304. Prince-Elector Baldwin of Luxembourg lays the groundwork for the Baldwin Bridge (Balduinbrücke) over the Moselle, aimed to link the Old Town to Lützel. It would not be completed until 85 years later. It remained the only way to cross the Moselle in the area until the early 20th century. Nowadays, it is the oldest bridge in the city. New walls are constructed around the city between 1249 and 1254. Around the same time (1248-1259), Archbishop Arnold II of Isenburg builds the Castle of Stolzenfels, next to the Castle of Lahneck belonging to the Archbishop of Mainz. Kudo and Werner von Falkenstein extend the castle between 1388 and 1418. During the Thirty Years' War (1618-1648), Coblenz would be occupied by the Swedes (In 1632), then by the French (1634 to 1646). In 1688, in the heat of the War of Succession of Palatinate, Coblenz was bombarded and destroyed by the French under Marshal de Boufflers. Between 1680 and 1819, a floating bridge, masterpiece of engineering of the time, assured the connection between both banks of the Rhine and Ehrenbreitenstein. The bridge was in fact composed of two large boats (up to 100 passengers) on each side of the river, linked by cables, as well as a road supported by 9 smaller boats. In 1786, the Prince-Elector of Trier, Clement Wenceslaus of Saxony, takes up residence in a new castle on the shores of the Rhine. He would play an important role in the extension and improvement of the city, builing notably the city's first water canalisation, as well as a new theatre. Coblenz turned into a major meeting point for the noble French émigrés (who had fled the new Republican and ant-aristocratic regime). This led the French Revolutionaries to take control of the city in 1794, but the citadel of Ehrenbreitstein managed to resist until 1799. Coblenz is incorporated to the French Republic and becomes the capital of the Rhine-and-Moselle department. The citadel of the Prince-Electors is dismantled. In 1806, a law university is established in the neighbourhood where the great Austrian statesman, Prince Klemens Wenzel von Metternich was born. It is also during the French period that the term Schängel started to designate someone born in Coblenz, a word still used nowadays. In March 1810, the French governor of Coblenz, Jules Doazan, errected a neoclassical well with an inscription in French celebrating the success of Napoleon's campaign of Russia. When the Russians arrived in the city on 31 December 1813, in a fit of ironic humour they added the line "Read and approved by us, the Russian commander of the City of Coblenz". The city was granted to Prussia by the Congress of Vienna in 1815. King Frederic William III immediately rebuilt the city's fortifications and the citadel of Ehrenbreitstein, making of Coblenz one of the most fortified military stronghold in Europe. In 1822, Coblenz was made the capital of the Prussian Rhine province. Frederic William IV of Prussia receives in present the ruins of Stolzenfels in 1823. Three years later, he commissions architect Jean-Claude de Lassaulx to rebuild the castle to use as his summer residence. The reconstruction was completed in 1842 in a blend of Neogothic and Romantic styles. An equestrian statue of German Emperor William I was inaugurated in 1897 by his grandson William II. After World War I, France occupied the area once again, and stayed until 1929. The city name, until then spelt "Coblenz", was changed to "Koblenz" in 1926 to distinguish it from the French spelling (and probably also becomes "K" looked more German than the Latin "C"). As many other cities, it was badly damaged in WWII. Between 1947 and 1950, it served as capital of Rhineland-Palatinate. The historical centre of Koblenz is divided in two parts : the Altstadt (old town), with its small and narrow streets, and the 18th-century Neustadt (new city), organised along broad boulevards. The main shopping street is Löhrstrasse, between the old town and the train station. The city's military and secular architecture comprises the fortress of Ehrenbreitstein (originally built around 1000, and rebuilt by the Prussians in the 19th century), the 13th-century Alte Burg ("old castle"), and the monumental 18th-century princely palace (Kurfürstliches Schloss). The castle of Stolzenfels is located 5km south of the city. 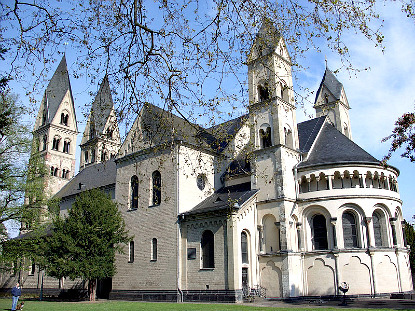 Koblenz's religious heritage mostly dates from the Romanesque period (11th to 13th century). The most noteworthy examples are the Basilika St. Kastor, the Florinskirche, and the Herz-Jesu-Kirche. The Liebfrauenkirche was originally built as a Romanesque church, but later incorporated various Gothic and Baroque elements. The famous 14th-century Baldwin Bridge on the Moselle is the oldest bridge in the region. The Moselle meets the Rhine at the so-called German Corner (Deutsches Eck, at the foot of the citadel), where the former headquarters of the Teutonic Knights were located. An enormous statue of Kaiser Wilhelm I has been standing there since 1897. 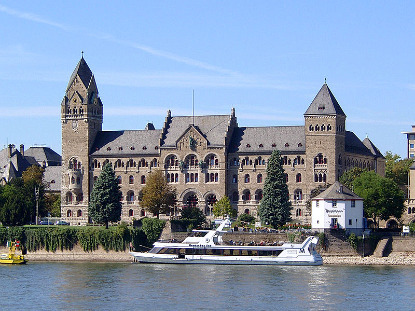 Note also the massive Neo-Romanesque Prussian Government Building (Preußisches Regierungsgebäude) along the Rhine. The birthplace houses of the Prince of Metternich (Haus Metternich) and of Beethoven's mother (Mutter-Beethoven-Haus) are open to the public. Landesmuseum Koblenz (State Museum of Koblenz) : located in the citadel of Ehrenbreitstein. Ludwig Museum : a contemporary art museum in the Deutschherrenhaus, former possession of the Teutonic Knights. Mittelrhein-Museum der Stadt Koblenz (Middle Rhine Museum of the City of Koblenz) : has collections of 19th-century paintings of the Rhine region. Rheinisches Fastnachtsmuseum (Museum of the Rhenish Carnival of Koblenz): located in Fort Constantin. Koblenz is located halfway between Cologne and Frankfurt am Main. Koblenz is at the junction of the E44 (A48) and E31 (A61) motorways. The E44 links it to Luxembourg, Trier and Frankfurt-am-Main, while the E31 follows the Rhine, northwards to Bonn, Cologne and Düsseldorf, and southwards to Mainz and Mannheim. There are frequent train connections between Koblenz and Bonn (30min to 1h), Cologne (55 to 75min), Düsseldorf (1h20min to 1h45min), Trier (1h25min), Mainz (50min), Frankfurt (1h25min), Mannheim (1h35min), Stuttgart (2h30min) and Saarbrücken (2h35min). There are a few direct trains per day to Luxembourg (2h15min).